As a family we love pan asian cuisine, it seems so much healthier and includes many different kinds of my favourite leafy greens. One of our favourite appetizers is salted Edamame. It is healthy, quick and delicious. I had been thinking of making edamame salad but could not come up with the right combination of ingredients and herbs and suddenly yesterday it struck me why not combine it with shitake’ mushrooms and basil and because all three have sweetish after taste why not add some jalepeno pepper to balance that and yes some sour sumac to give it some middle eastern touch. Voilla that did it !!!! The melange’ of flavours is unique with ingredients from different regions but somehow works. The key is to let the flavours seep in. The salad tasted great the next day or atleast after sitting for 8 – 10 hours. 1.Mix all the ingredients for the dressing and put aside. 2.. Blanch the edamame pods for 10 minutes in boiling water so they are tender crisp. 3. Once cool take out the seeds and put in a bowl. 4. Heat 1/2 tsp. of oil or ghee and saute’ the mushrooms so they are fragrant and golden brown. 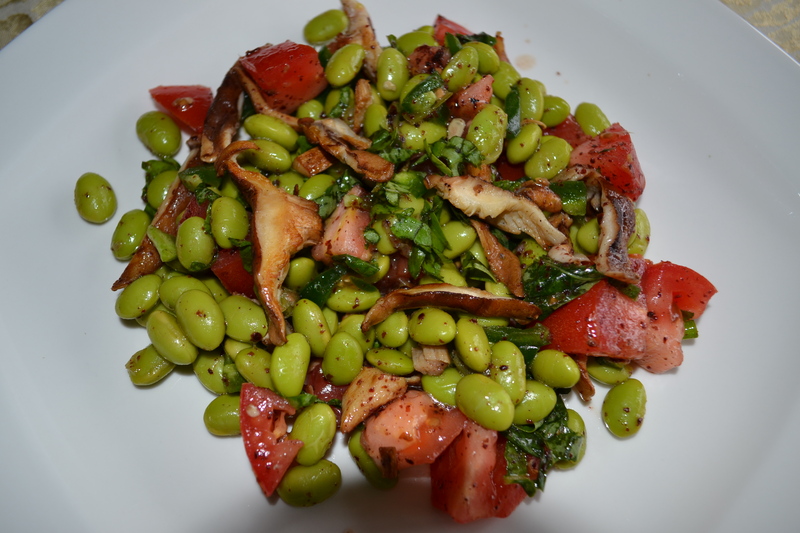 5.Mix the dressing with the edamame, tomato and grilled mushrooms and basil. 6. Toss well and let sit for 6-8 hours and enjoy a protein rich colourful salad. Valentine’s Day is celebrated all over the world as a day when you express love for your loved ones, be it a man’s romantic love for a woman, mother’s selfless love for her child, or your love for your best friend. Some people argue why do we need a designated day dedicated to expressing our love for the people we care for deeply in various relationships. My personal view is that everyday we need to live and celebrate our life to the fullest, cherish and treasure our relationships. In honour of the Valentine’s Day which was celebrated yesterday or if you treat everyday as a special day this heart healthy ( no heart no love!!! ) salad is for you. It is a simple, beautiful lip smacking salad loved by one and all. Hope you will love it as much as we did. This salad uses strawberries which have been long associated with love, greens which signify life ( hence the name Greenzgrains for this blog, no greens no life!!!! ) topped with hemp hearts and slivered almonds full of omega 3’s vital for the optimum functioning of the heart. 1. Mix the dressing thoroughly and put aside. 2. In a salad bowl toss the greens with the dressng. 4. Sprinkle the hemp hearts and the almonds on top. Because of the dressing the nuts and seeds will stick to the greens. 5. Serve fresh and Enjoy !!!! The weather in Toronto is still very cold if not brutal. I love my cold green salads but in these severe winters they make you feel just more cold and grumpy. You need hot and hearty carbohydrate rich feel good foods. 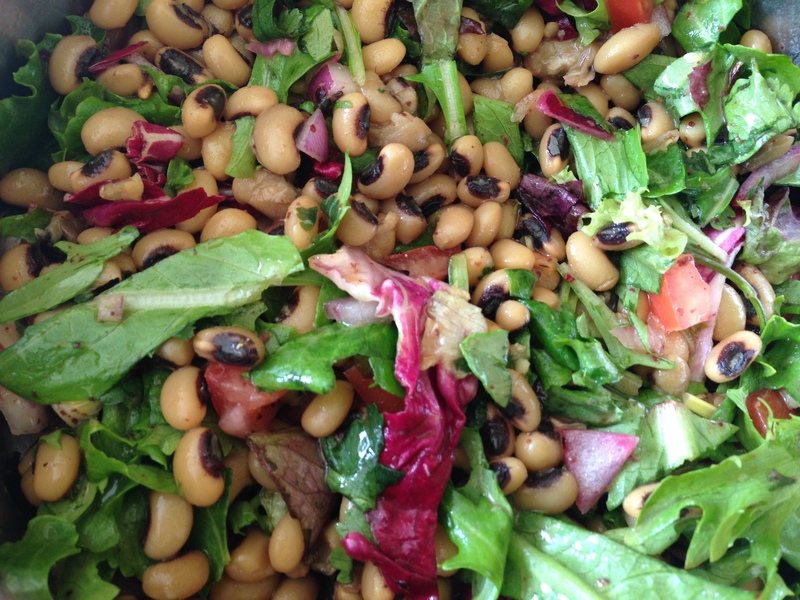 I came up with this salad using simple, humble pigeon peas also known as black eyed peas which taste good even plain without being dressed with fancy herbs and oils. I used warm ( not hot ) peas in the salad with my favourite salad mix and with very simple dressing. I used sumac which I have not used before in this kind of salad. One of my dear friends had visited Turkey recentely and brought me beautiful, delicious, sour sumac.I must say the result was a lipsmacking, hearty very pretty salad. Hope you will love it as much as my family did. Mix well all the ingrdients and enjoy !!!!! Serve as a side salad or as a main for lunch, it will shine no matter what. A crisp crunchy delicious salad for the icy but lazy weekends. 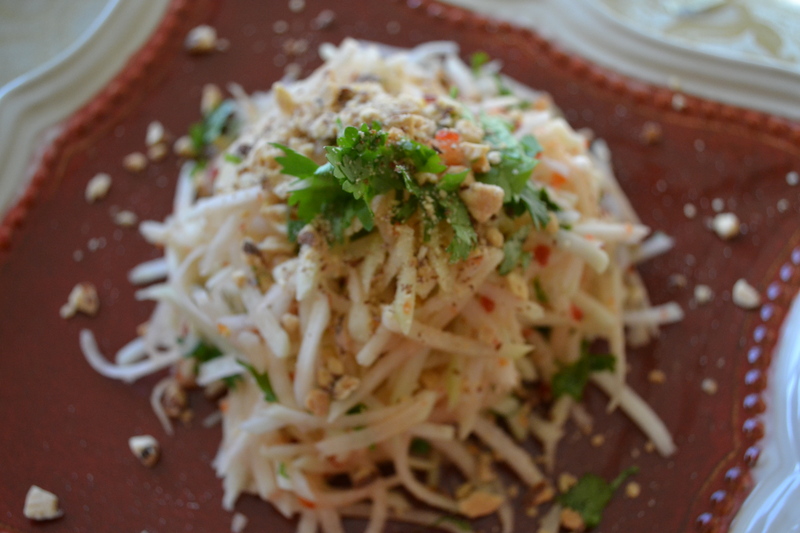 The sweet, spicy and crunchy refreshing salad hits the spot in the unusually cold weather. 1.Mix all the ingredients for the dressing except the crushed peanuts. Shake well and let sit for couple of hours or more. 2. 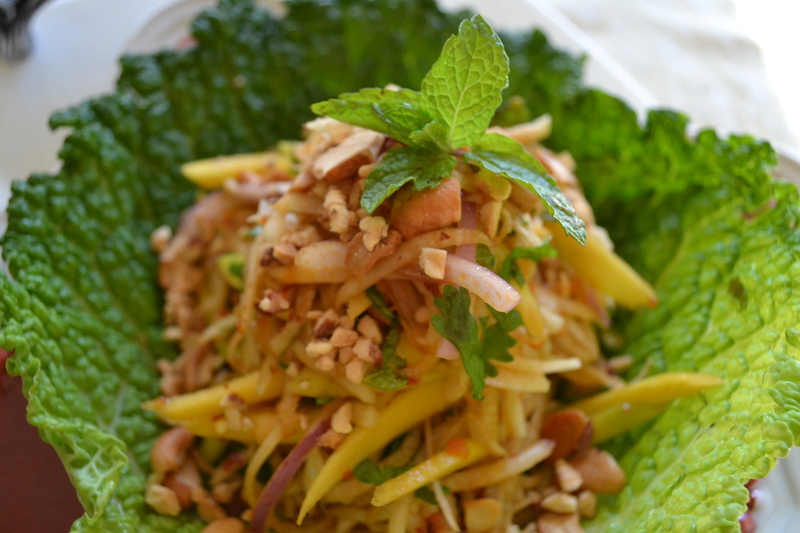 Mix the papaya and the mango with the dressing and garnish with crushed peanuts. 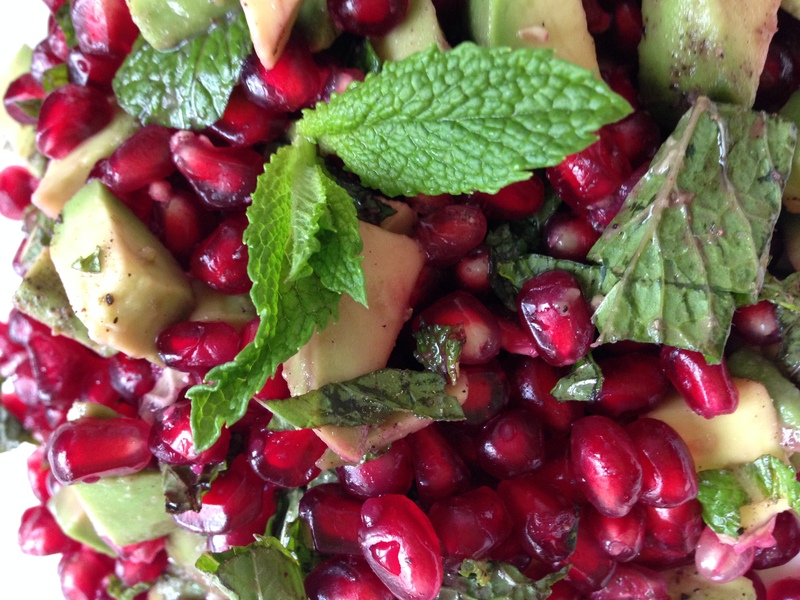 The combination of airy, sweet, passionate red pomogranate and bright green,dense but rich avocado is a perfect marriage of taste, flavour, looks and substance. With bare minimum seasoning the true taste of both the ‘superfood’ fruits shines. Enjoy and do let me know if you liked the combination as much as my family did. 1. Peel and remove the arils from the Pomagranate and remove any white skin stuck to the arils. 2. Peel and cut the the firm but not raw avocado into small cubes. 3. Squeeze little lime juice on the avocado to prevent oxidation and subsequent discolouration. 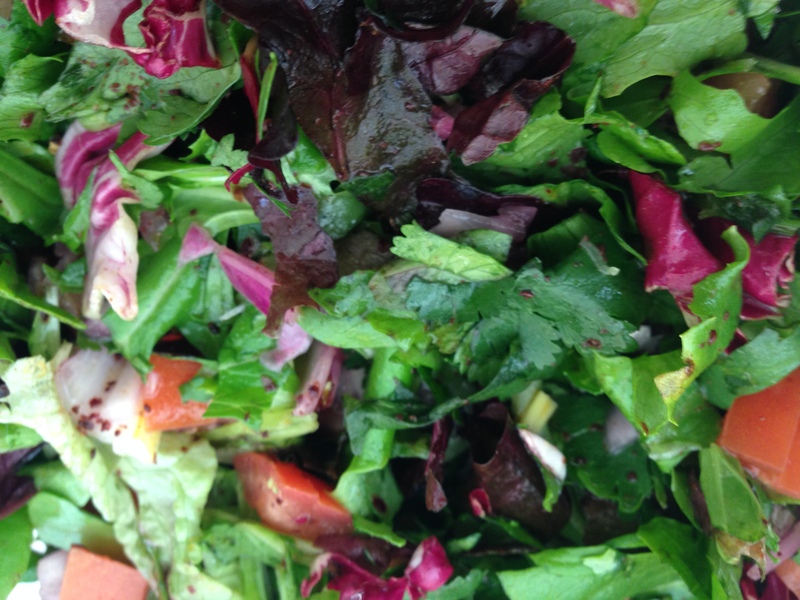 4.Mix all the ingredients and Enjoy a beautiful radiant salad. We are in the middle of frigid subzero temperatures in Toronto, even though I love salads, I did not want to have something cold and then I remembered this salad which is served with a steamed snack in India. I have modified and simplified this salad to suit my taste. Hope you will love the simplified version. Green raw papayas are an amazing powerhouse of nutrients. It is low in sodium, high in potassium (so very good for your heart !! ), high in antioxidants and good source of digestive enzyme papain. 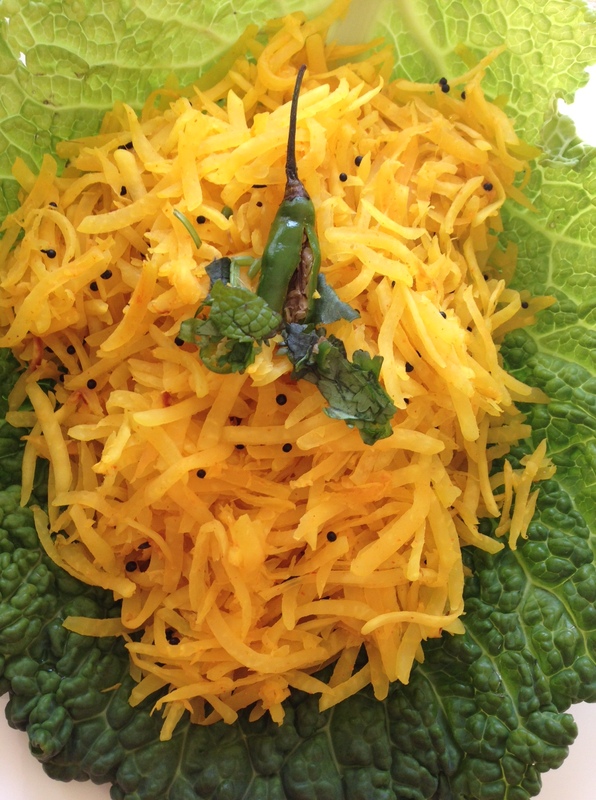 A simple delicious, nutritious salad with texture and no ATTTITUDE!!!! 1. Heat the oil in a skillet and fry the mustard seeds on medium heat till they are white and stop popping ( you may keep a lid so that they do not fly all over the place). 2. Add the green chillies, 1/2 tsp. turmeric powder and grated papaya and saute’ for few minutes till the papaya loses the raw, dense look and is somewhat softened. 3. Turn off the the stove, add lime juice and salt and serve. Serving Suggestions – may serve as a side salad or as a filling for crepes and wraps. A crisp beautuful salad exactly like icy cold beautiful sunny morning that we have here. It is delicious but so healthy full of papain enzymes. Mix all the ingredients and garnish with toasted almonds.